White piedra is a superficial fungal infection of the hair shaft, caused by Trichosporon, a noncandidal yeast characterized by the presence of numerous, discrete, asymptomatic nodules attached to the infected hair shafts. White piedra is considered a disease of tropical regions and occasionally reported from temperate countries. Although Candida parapsilosis such as Candida albicans is well known to cause cutaneous infections, it has been reported as a co-isolate for white piedra along with Trichosporon. We report a case of white piedra from a temperate region caused by C. parapsilosis. White piedra is a fungal infection confined to the hair shafts, resulting in the formation of soft, white, gray, or brown superficial nodules. It was thought to be caused by Trichosporon beigelii, but after genetic analysis, Trichosporon ovoides is now considered to be the agent of white piedra from scalp hair, whereas Trichosporon inkin, Trichosporon asahii, and Trichosporon mucoides from the crural regions. Rarely, Trichosporon species may be accompanied by Candida parapsilosis, although it is unclear whether this is really a co-infection. A case of white piedra of the scalp caused by T. inkin with co-isolation of C. parapsilosis was reported in 2004. We report the first case of white piedra caused by C. parapsilosis, without associated Trichosporon from a temperate region of India. 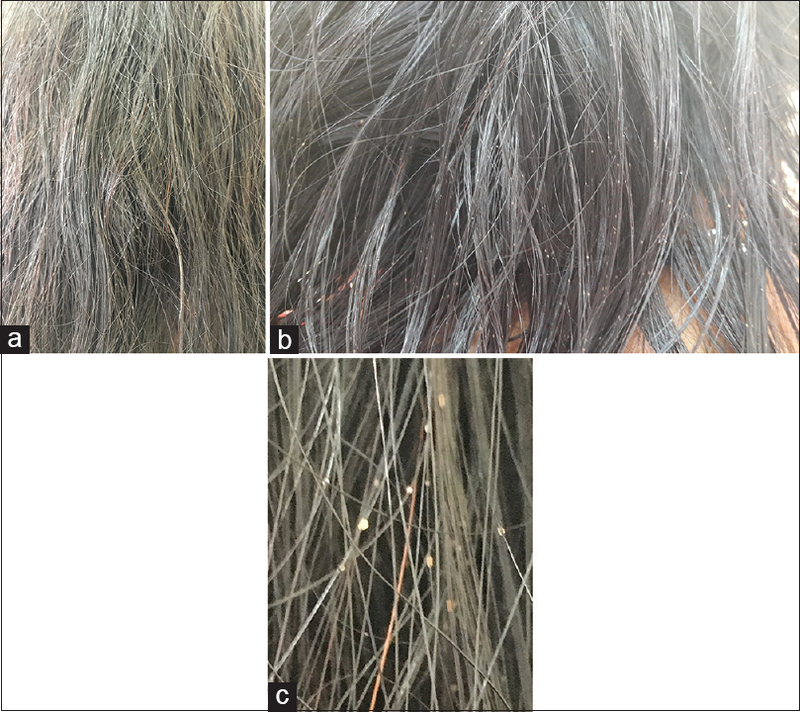 A 42-year-old female, resident of Shimla, presented with asymptomatic white knot-like entities over her scalp hair for 5 months, which were gritty and tightly adherent to hair and became prominent on wetting the hair. There was no history of hair fall or breakage. There was no definite history of tying wet hair. The patient was otherwise healthy without any systemic or dermatological complaints. There was no history of similar complaints in the family. On examination, there were small white nodules over the hair shafts, about 1 mm in size, involving most of the hair, distributed irregularly along the hair length, and encircling the hair shaft [Figure 1]. The nodules were hard, nonbrittle, and immovable over the shaft. There was no evidence of pediculosis, seborrhea, or alopecia. The hair over the other areas of the body was normal. 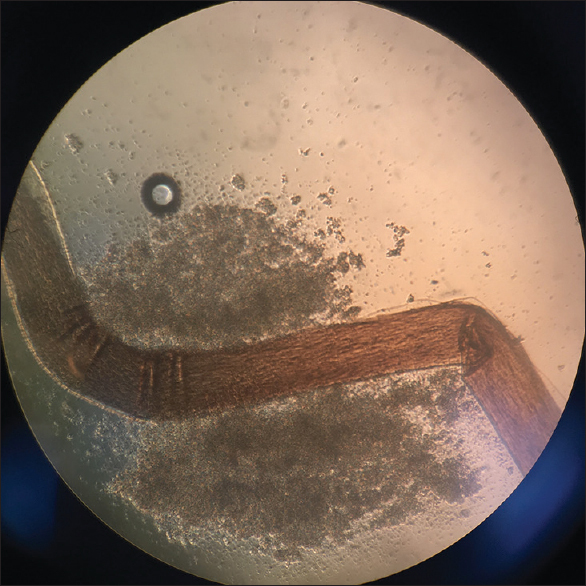 Direct microscopic examination of 10% potassium hydroxide wet mount showed sleeve-like concretions encircling the hair shafts with a spore-like structure, composed of hyphae and blastoconidia [Figure 2]. 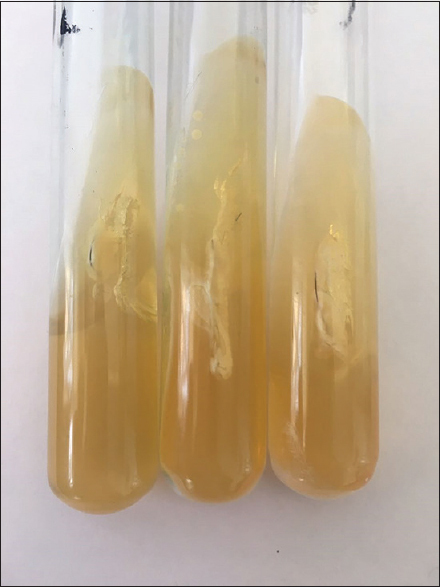 The fungal culture of the hair strands was done on two sets of Sabouraud dextrose agar (with chloramphenicol and without cycloheximide) and incubated at 37°C [Figure 3]. Moist yeast-like, cream-colored pasty colonies grew after 2–3 days of incubation in all the four tubes. 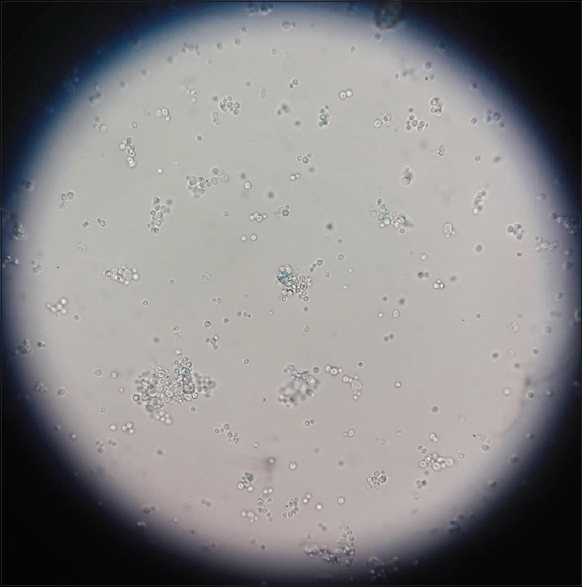 Microscopic examination of the lactophenol cotton blue mounts demonstrated oval budding yeast-like cells about 3–5 μm in size. No anthroconidia were observed [Figure 4]. Species identification was done from three isolates by BD automated Phoenix system(Becton Dickinson Yeast identification Panel) using yeast panels. These were confirmed as C. parapsilosis in all the three tubes with 99% confidence limit. The patient was prescribed 2% ketoconazole shampoo along with itraconazole 100 mg twice a day for 4 weeks and advised to follow after 4 weeks, but was lost to follow-up, probably because the condition was cured. Superficial mycosis involving hair includes black piedra and white piedra. Black piedra generally involves scalp, whereas white piedra is more common on the hairs of the beard, mustache, and genital areas. White piedra is a disease of tropical regions and occasionally reported from temperate countries. Our patient was a resident of Shimla, a temperate region in North India (31.1048 N, 77.1734 E, altitude 2276 m from the sea level and temperature range – 4°C–31°C). White piedra is caused by Trichosporon species, which under normal circumstances is commensal in the human body, but can cause opportunistic infections such as Candida. The incidence of candidiasis has increased considerably over the past three decades, mainly due to the rise of the AIDS epidemic, an increasingly aged population, higher number of immunocompromised patients, and the more widespread use of indwelling medical devices. Candida albicans is the main cause of candidiasis; however, nonalbicans Candida species such as Candida glabrata, Candida tropicalis, and C. parapsilosis are now frequently identified as human pathogens. Over the past decades, the incidence of C. parapsilosis has dramatically increased. C. parapsilosis was first isolated by Ashford. The species was named Monilia parapsilosis to distinguish it from the more common isolate, Monilia psilosis, better known today as C. albicans. Although initially considered nonpathogenic, C. parapsilosis was identified as the causative agent of a fatal case of endocarditis in an intravenous drug user in 1940. C. parapsilosis cells display oval, round, or cylindrical shapes. When grown on Sabouraud dextrose agar, colonies of C. parapsilosis are white, creamy, shiny, and smooth or wrinkled. C. parapsilosis is one among the common major causative agent of nonalbican candidiasis (endocarditis, meningitis, peritonitis, onychomycosis, vulvovaginitis, and urinary tract infections). It has also been isolated from hair and nail substrates of healthy volunteers by scanned electron microscopy under aseptic conditions (after multiple washes with sterilized distilled water, 70% ethanol, and acetone) by Oliveira et al. Cell morphology of the two phenotypes (crepe and smooth) has been identified. Cells from the crepe phenotype are predominantly elongated, with size 1–5 μm, and smooth phenotype are small and yeast shaped, ranging from 0.5 to 3 μm in size. C. parapsilosis has been co-isolated from white piedra of the scalp with T. inkin, and it was thought to be an associate, as its role as a causative organism was not clear; however, in the present case, C. parapsilosis was the only yeast isolated from multiple fungal cultures. This supports our inference of C. parapsilosis being the sole causative agent in this case. The American Academy of Dermatology Guidelines Committee recommends complete removal of the infected hair as the treatment of choice for white piedra. However, total shaving of the scalp hair is not socially or culturally acceptable. Various topical antifungal products including imidazoles, ciclopirox olamine, 2% selenium sulfide, 6% precipitated sulfur in petrolatum, chlorhexidine solution, Castellani's paint, and zinc pyrithione have been used as modalities of treatment with various outcomes. However, systemic treatment is required as topical formulations are incapable of achieving significant therapeutic concentrations in the intrafollicular portions of the hair that harbor the fungus. In a study by Khandpur and Reddy, itraconazole was found to be effective in 11 patients with culture negativity at 8 weeks of therapy. The limitation of our study is that we were unable to perform repeat fungal culture after the completion of therapy as the patient was lost to follow-up. Trichosporon species has been identified as the causative agent in all reported cases from India; however, all cases were from tropical regions (South India and Chandigarh).,,, Ours is the first case from a temperate region. A definite relationship between the yeast causing white piedra and geographic location needs to be ascertained in future studies. We suggest that C. parapsilosis can cause white piedra independent of Trichosporon species, especially in temperate region. Thus, this case would generate awareness among dermatologists and laboratory physicians so that growth of Candida sp. alone may not be discarded as contaminating factor. Hay RJ, Ashbee HR. Mycology. In: Burns T, Breathnach S, Cox N, Griffiths C, editors. Rook's Textbook of Dermatology. Vol. 2. West Sussex, UK: Wiley-Blackwell; 2010. p. 36.16. Taj-Aldeen SJ, Al-Ansari HI, Boekhout T, Theelen B. Co-isolation of Trichosporon inkin and Candida parapsilosis from a scalp white piedra case. Med Mycol 2004;42:87-92. Silva S, Negri M, Henriques M, Oliveira R, Williams DW, Azeredo J, et al. Candida glabrata, Candida parapsilosis and Candida tropicalis: Biology, epidemiology, pathogenicity and antifungal resistance. FEMS Microbiol Rev 2012;36:288-305. Trofa D, Gácser A, Nosanchuk JD. Candida parapsilosis, an emerging fungal pathogen. Clin Microbiol Rev 2008;21:606-25. Oliveira MT, Specian AF, Andrade CG, França EJ, Furlaneto-Maia L, Furlaneto MC, et al. Interaction of Candida parapsilosis isolates with human hair and nail surfaces revealed by scanning electron microscopy analysis. Micron 2010;41:604-8. Khandpur S, Reddy BS. Itraconazole therapy for white piedra affecting scalp hair. J Am Acad Dermatol 2002;47:415-8. Khatu SS, Poojary SA, Nagpur NG. Nodules on the hair: A rare case of mixed piedra. Int J Trichology 2013;5:220-3. Viswanath V, Kriplani D, Miskeen AK, Patel B, Torsekar RG. White piedra of scalp hair by Trichosporon inkin. Indian J Dermatol Venereol Leprol 2011;77:591-3. Tambe SA, Dhurat SR, Kumar CA, Thakare P, Lade N, Jerajani H, et al. Two cases of scalp white piedra caused by Trichosporon ovoides. Indian J Dermatol Venereol Leprol 2009;75:293-5. Shivaprakash MR, Singh G, Gupta P, Dhaliwal M, Kanwar AJ, Chakrabarti A, et al. Extensive white piedra of the scalp caused by Trichosporon inkin: A case report and review of literature. Mycopathologia 2011;172:481-6.